As some of you regular readers know, I have a total "thing" for blushes. With my super fair porcelain skin, I *need* blush to get that healthy glow. Blush gives me some color and perks up my face. Honestly, I like almost every single blush that I try. But, certainly I love some more than others. Generally, I tend to gravitate towards pink and peach toned blushes. So, I was super excited to try out this Blush Patrol baked blush by Napoleon Perdis with its deep burgundy and gold tones. Bronzers are great for adding color too, for all skin tones. I like using them for contouring as well as giving my skin a "tan" glow. Now, I am a bit more selective with bronzers. Some bronzers turn my skin "muddy" or are generally too orange. I also don't want a product that is too loaded with shimmer. So, I am looking for just the right balance of color and "glow" to give my face a sunny warmth. Since I use high SPFs every day, a bronzer is really the only way that my face gets a "tan". This Bronze Patrol baked bronzer by Napoleon Perdis looks like it has just the right balance of warmth to give my skin a sunny summer glow. 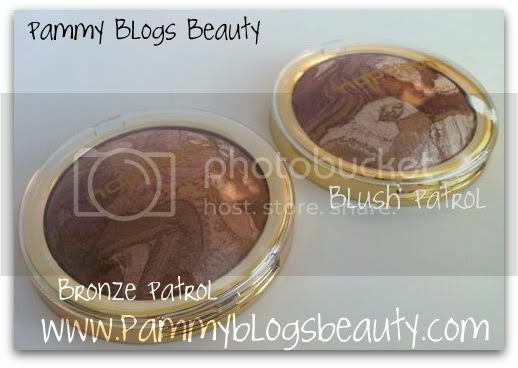 Keep reading for my full review and swatches of Napoleon Perdis Blush Patrol and Bronze Patrol. 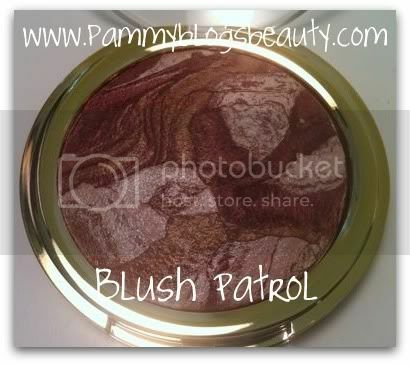 At first glance, I thought that the Bronze Patrol and Blush Patrol looked like the same product! They have identical packaging and are both baked marbleized powders. But, when you swatch or wear them, they are clearly different. While these products are both beautiful individually, they look gorgeous when worn together. 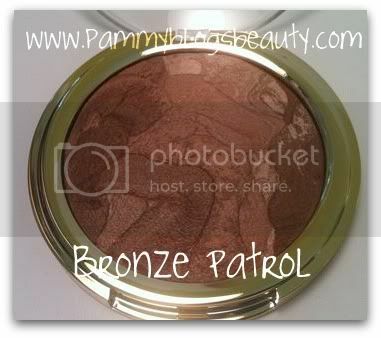 Napoleon Perdis Blush Patrol and Bronze Patrol were recently debuted in May of 2011. The formulas are enriched with Vitamin A and C.
Each compact is unique with variations in the baked veined patterns in the product. Packaged in a super shiny gold compact with a clear lid and gold lettering. The compact is sturdy and sleek and is not overly bulky. 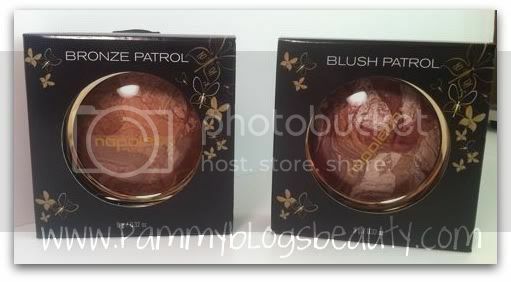 Both the Blush Patrol and Bronze Patrol retail for approximately $50.00. Let's start with the Bronze Patrol. What a gorgous bronzer! I believe this natural bronze color would look flattering on most skin tones. On me, it gives me the perfect bronze glow! I wear this and think, wow, I look "tan"! The shade looks like a metallic bronze with just a hint of "glow" there is no obvious sparkle, but just a nice and natural looking luminescence. That is exactly the look that I am going for with bronzers. This might end up being one of my favorite bronzers! Bronze Patrol is super-pigmented and extremely long wearing. I am so impressed with the wear! This bronzer will wear all day without fading. I like to apply this with my Sigma F25 Tapered Face brush. This brush allows for the most precise placement. I apply in the basic "3" pattern to my face and under my jawline. Application Tip: This product can also be used wet or dry! To use wet, just dampen a cosmetic sponge and tap over the area you would like to bronze. This product can also be used as an eyeshadow. Just mist an eyeshadow brush with water and tap over product. Looks great on the lids or outer corner of the eye. This is a "new improved formula". Now, I haven't tried the previous formula. So, I can't compare. This product contains Vitamins A and C as well as Lauroyl Lysine for a smooth and silky texture. This dome shaped baked product contains marbled veins of gold, white, deep plum, and pearly rose shades. When swirled together the effect is a deep metallic pinkish-plum copperish shade. It really straddles the line between blush and bronzer (But, this should totally be worn as a blush. It just has bronze tones). Blush Patrol contains beautiful microfine gold microshimmer. This product certainly has more sparkle than the Bronze Patrol. The sparkle looks lovely on this skin and is not over-the-top glitter. It just looks pretty! A beautiful "sunkissed" rose-gold glow! This blush is super-duper pigmented. With my uber-fair skin, it is way too bold on me when applied with a regular blush brush. Darker skin tones would probably find this to be the perfect blush. But, I found a way for it to work extremely well on me. I apply with a VERY light hand using a stippling brush. This way, it looks perfect! I still get bold color, but it looks beautiful and natural. I put this on and think "Wow, I have *color*!" Since I apply with such a light hand, this product should literally last me forever. What impresses me the most: the staying power. This blush literally lasts all-day long! The longest wearing blush that I have ever worn! Application Tip: Just like the bronzer, this product can also be used wet or dry! To use wet, just dampen a cosmetic sponge and tap over your cheekbones. This product can also be used as an eyeshadow. Just mist an eyeshadow brush with water and tap over product. 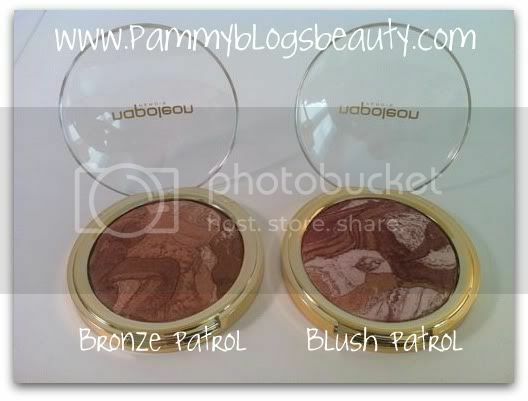 I really loved both the Blush Patrol and Bronze Patrol by Napoleon Perdis! Yes, these products are expensive. Actually, these are probably the most expensive blush and bronzer that I have tired. These are also amongst the most pigmented of the blushes and bronzers that I own. So, are they worth the price? In a word, yes. The quality is very apparent in these products. You are getting luxurious products with deep and lasting pigmentation. One application in the morning is all you need. These products wear absolutely all day with no fading. Amazing! Also, I love how beautiful these two products look when worn together. I think these were just made to be paired together! I mean, sure, there are less expensive alternatives out there. But, if you can afford these blushes, then you are going to be happy with their pigmentation, overall effect, and performance. I am happy to have these in my makeup collection and will be reaching for them when I want a bolder and lasting blush and bronzer effect. Thank you so much for reading! I hope you enjoyed this review. Napoleon Perdis products can be found at Napoleon Perdis concept stores, ULTA, Dillard's, and Von Maur department stores. NP Set can be found at Target. Wow those are very pigmented and beautiful shades! I've never looked into this brand before. @PerilouslyPale-Yes, these are certainly the most pigmented blush and bronzer that I have ever used!